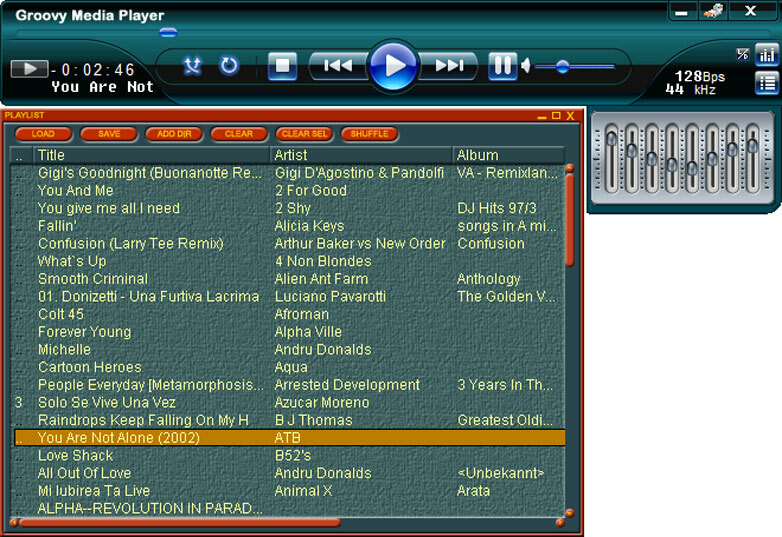 Groovy Media Player is the perfect music-manager application with cool looks and a garland of features. It has Internet streaming, continuous play, mp3 to wav converting function plus a bunch of other amazing features. Groovy Media Player is not a resource-greedy program and includes a built-in ID3 editor to have audio files renamed and modified much easier. Out of the Box, into the Groove!Groovy Media Player is the perfect music-manager application with cool looks and a garland of features. It has Internet streaming, continuous play, mp3 to wav converting function plus a bunch of other amazing features. Groovy Media Player is not a resource-greedy program and includes a built-in ID3 editor to have audio files renamed and modified much easier.Apart from unique features and an advanced playlist editor Groovy Media Player offers any of the basic functions you'd normally expect from an audio player: minimize-to-tray system, always on top, exit after play, and a bunch more that you will quickly learn. The program's 8-band EQ is merged into main window so you can easily access the frequency settings at any time (don't worry it's small so it won't bother you).If you like to get very specifical with your playlist there's plenty of room to move in and cover all the information you need: you can include criteria such as title, artist, album, year, track number, genre, length and more. You can choose time counter-modes in the main window (either elapsed time or remaining time) with just one click. You can also enable the scrolling mode for displaying titles. On top of the repeat-type mode indicator are placed the bit rate and sample rate and all the rest of functions.From installing it to actually using Groovy Media Player is all about ease of use and joy. The handy drag and drop function, Ctrl click, click Shift click selection or Del usage are also provided. The program comes with the ability to perform mp3 to wav transformations. You just need to specify the corresponding output in the settings pane and let the app amaze you.Set a good configuration and you will have a maximized performance from the program which is able to do a lot of things including play FLAC, AAC, MP4, WMA and other formats.NOTE: The software is delivered free of charge!